Counterfeit money damages the economy via inflation by artificially increasing the money supply. That's not a good thing but counterfeiters aren't real concerned with monetary policy. For them it's all about the Benjamins. From the forger’s point of view you'd think that paper currency would be the way to go due to its high face value relative to coins and the low barrier to entry in terms of raw materials, equipment and skill requirements. 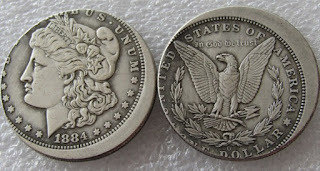 Nevertheless there are those who choose to imitate collectible coins, so it is the wise numismatist who keeps his or her eye on counterfeiting trends. For error collectors, it's unsafe to think that error coins are immune to the copy risk that is widely recognized with gold and key dates. Thanks to the global ecommerce and manufacturing technology revolutions it's now easier and more profitable than ever for counterfeiters to move cheap fakes including error coins. Counterfeiters thrive in regions of the world that have low labor costs and laws that allow manufacturers to produce and sell replica coins without marks indicating their non-genuine nature. This laissez faire policy is in stark contrast to the United States Hobby Protection Act of 1973 that requires such items to be marked to positively identify them as imitations, but clearly the written law alone does not ensure compliance. It is strongly recommended that coin collectors research and learn the breadth and scope of fake coins that are openly sold online. Articles written to protect consumers can unwittingly serve as tutorials for idea starved criminals, so please understand when we ask you to use a search engine rather than supplying links. Search keywords ‘replica coin’ and/or ‘copy coin’ for an eye opening look at the dark side of internet commerce. Examples of fake error coins that are widely distributed today are shown below. There's an old saying that when things go wrong they go wrong in bunches. Exhibit (a) is the multiple error coin pictured below. 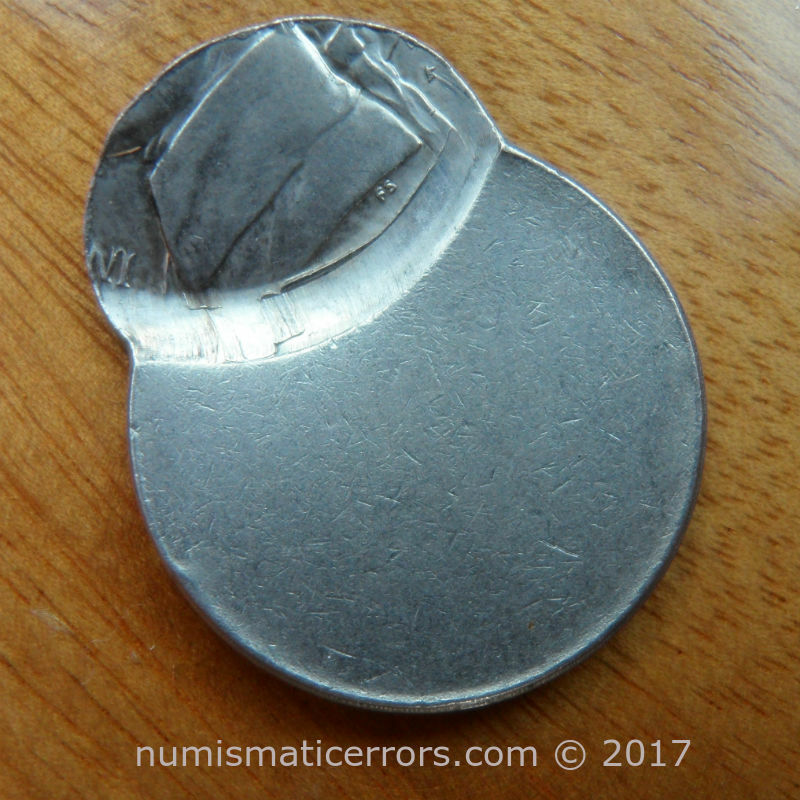 Both sides were struck off center because the planchet was not coaxially aligned with the striking dies. 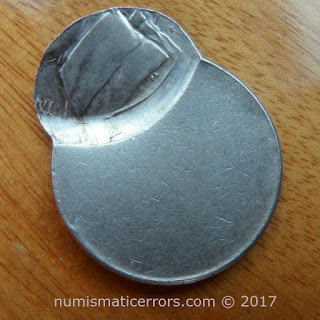 The obverse (heads) side was struck by the proper obverse die but the reverse die was capped by a previously struck coin, so an incuse mirror image obverse design was struck on the reverse (tails) side of this coin. Good luck finding that in the manufacturing work instructions! In laymen's terms this is a two-headed coin while in numismatic terms it's a brockage strike. 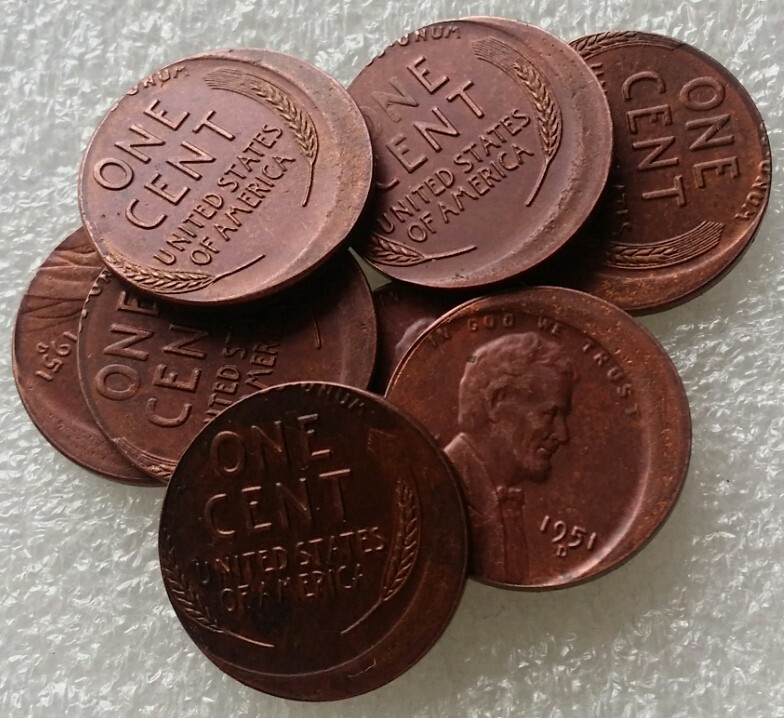 Coin dies have service lives measured in hundreds of thousands of strikes because dies are hardened steel and planchet alloys are softer. A Jefferson Nickel die cap is too soft to strike planchets of the same material (copper nickel alloy) because both deform at the same rate, producing a short run of brockage coins that rapidly degrade from early stage mirror images to late stage 'uniface' blobs bearing no resemblance to the original design. The small distinct initials "FS" (designer Felix Schlag) and other features visible in the photos below indicate that this is an early stage brockage. If you want a detailed brockage, go early or go home! See this eBay item 162395383455. 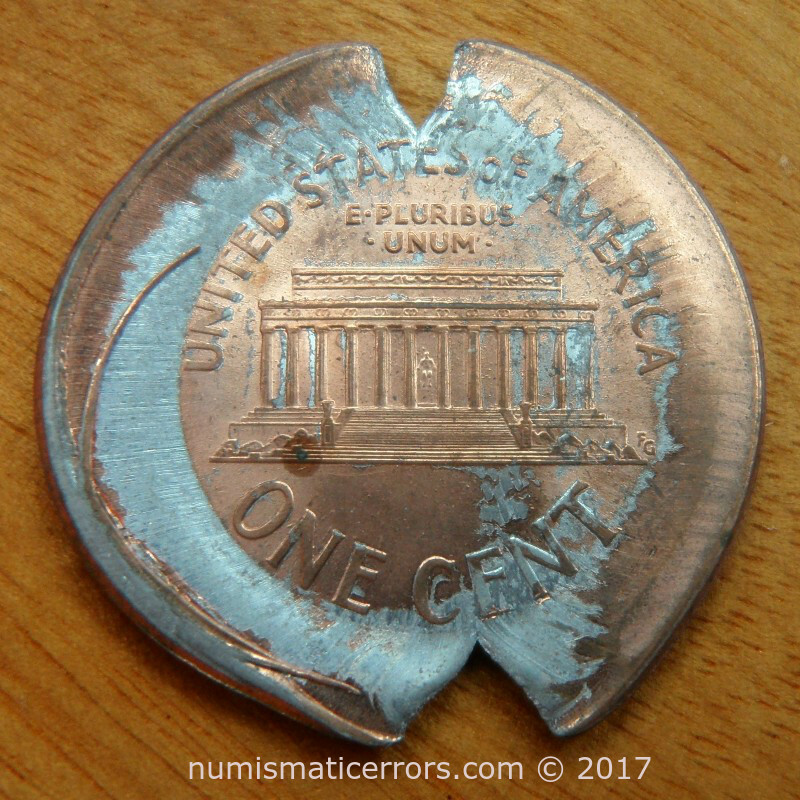 Here we have a post-1980 copper plated zinc core Lincoln Memorial cent that had a bad day at the office. 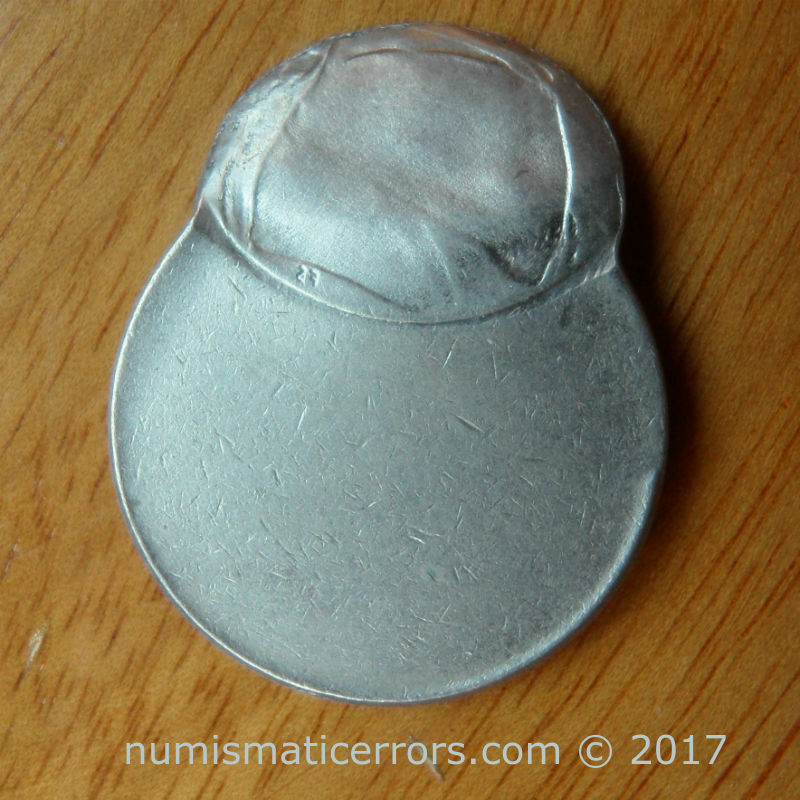 Something went horribly wrong as this particular planchet advanced towards the striking press. 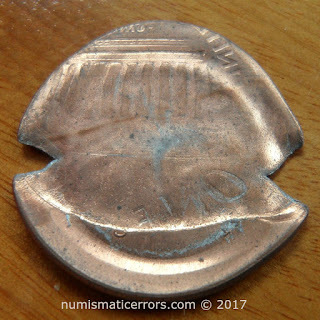 A planchet ahead of this one was struck but instead of ejecting it stuck to the obverse die, effectively 'capping' the die. Subsequent blank planchets were struck by the capped die until the cap disintegrated or was removed. The temporary run of malformed pieces are known as brockage errors. The coin pictured below experienced not only a brockage strike but also a retaining collar failure that allowed dramatic radial deformation and copper plating separation from zinc core. Also, using the v-shaped rim fractures as a clocking reference you can see one more twist - the obverse die cap rotated 90-degrees relative to the opposing reverse die. See this eBay item 162391434741.